Racing Club's Diego Milito applauds the home fans during his side's second leg match against Independiente. On Sunday, two Argentine clubs had one place left to fight for in the 2016 version of the Copa Libertadores, South America's equivalent of the Champions League -- and the dispute for it could hardly have been more evocative. That final slot would end up going either Independiente or Racing Club, the neighbours and rivals from Avellaneda, the working class district just across the River Riachuelo from Buenos Aires city. These two teams have tradition in spades, and their stadiums are just a few hundred yards apart. Their intense rivalry goes back decades, and these two matches -- a home and away play-off with a Libertadores place at stake -- will inevitably form an important part of the folklore of the Avellaneda derby. 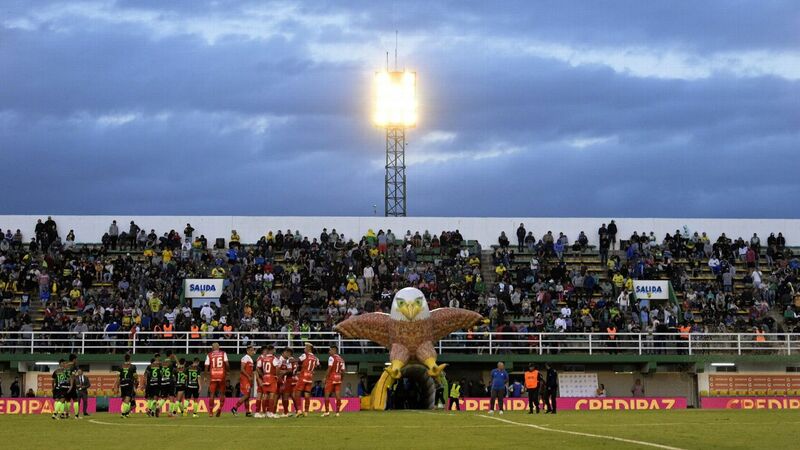 Future historians of Argentine football and society might do well to put the two playoff legs under the microscope -- they ended up revealing plenty about the mentality of the local footballer. Although the away side in both legs had no travel time to inconvenience them, they were stepping into a hostile environment. The serious problem of football-related violence means that no visiting fans are currently allowed in any stadium in Argentina for club matches. In the first leg, Racing's players would have felt very much alone in Independiente's stadium, and vice-versa in Sunday's return game. This is an ordeal for the majority of footballers -- indeed, a glance at the South American statistics shows the importance of home advantage. In both the Libertadores and the continent's World Cup qualifiers, there is often a ratio of around three homes wins to every away triumph -- making a win for the road team twice as rare as in Europe. And that is in games where visiting fans are permitted. But there is something in the Argentine mentality which means that adversity can often bring the best out of them. In these two matches, a total of 5 goals were scored. Only one went to the home side. The other four were all greeted with an incredulous, hostile silence. But it was that lone home goal that effectively decided the tie. Racing won the first leg 2-0 in Independiente's stadium. But with around 25 minutes to go in the return game, Independiente pulled one back. Shortly afterwards, though, Racing centre-back Luciano Lollo met a corner with a towering header. The stadium erupted. Surely there was no danger for the home side now. Independiente needed two goals in 20 minutes to force a penalty shootout, and suddenly Racing were full of confidence, pinging the ball around the pitch in a way that nerves had not allowed them to do beforehand. Independiente's first reaction was to sense that the chance of a comeback had slipped away. They were going down, but they were going to do so fighting -- literally. Central midfielder Jesus Mendez was giving all the signs of a player who had lost his head, and it was hardly a surprise when, just inside the last ten minutes, he threw an elbow and was sent off. Racing Club's Gustavo Bou, left, consoles Jesus Mendez after the Independiente midfielder was sent off during Sunday's clash. Three minutes later he was joined in the showers by his midfield colleague, Jorge Ortiz, who threw an even more blatant elbow and was also shown a red card. But once the team had got those pieces of rebellion out of their system, suddenly there was a game on once more. Down to nine men, missing 20 percent of their outfield strength, Independiente should have been swamped, with Racing putting on a late show for their fans. But that is not what happened. The visitors got the bit between their teeth and decided that a comeback was still possible -- and it so nearly happened. In the 90th minute, Cristian Rodriguez, the veteran Uruguayan international, carved out an opening and striker Juan Martin Lucero crashed an angry shot past Racing keeper Sebastian Saja at the near post. Independiente's nine men were suddenly facing eleven bags of nerves. There was time for two final attacks. Lucero sent another shot wide -- and then a hopeful ball was punted forward from deep. The home defence dealt with it badly, and up to provide some physical presence, Independiente centre-back Victor Cuesta blasted a volley which looked goal-bound, but which ended up flying just over the angle. Independiente may have been three inches away from taking the tie to an improbable penalty shootout, but their final 15 minutes were bang on target in highlighting the good and bad sides of Argentine football's fighting spirit.